In 1978, North Carolina Governor Jim Hunt appointed Charles B. Wade, Jr. to America's 400th Anniversary Committee (AFHAC), which was created to plan the celebration of the quadricentennial of the Roanoke Voyages. Wade, a native of Carteret County, was a graduate of Duke University and vice-president of the R. J. Reynolds Company. He was selected to head up an AFHAC sub-committee to build a ship similar to those on which the colonists would have sailed during their journey from England to Roanoke Island. Governor Hunt hoped this ship could become one of the cornerstones of the quadricentennial celebration. The committee eventually chose to model the ship after the Elizabeth, a 50-ton, square-rigged, three-masted bark. Naval architect Stanley Potter was hired to design the ship and O. Lie-Nielsen of Rockland, Maine was awarded the contract to build the vessel. Construction began in 1982 on the site of Roanoke Island boat building pioneer George Washington Creef's old boat works, which had been donated to the town of Manteo by Creef's heirs. Measuring 69 feet long, 17 feet wide, and drawing eight feet of water, the Elizabeth II was launched in November 1983, and is now the centerpiece of Roanoke Island Festival Park. The Charles B. Wade, Jr. Papers consist primarily of Wade's correspondence from the AFHAC sub-commitee and meeting minutes. This collection is arranged topically. 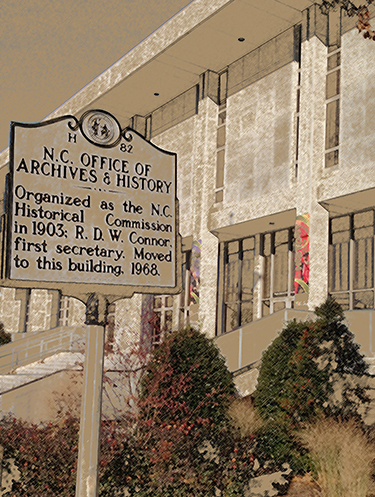 The North Carolina General Assembly created America's 400th Anniversary Committee (AFHAC) in 1973, to plan the celebration of the quadricentennial of the Roanoke Voyages. Chaired by Dr. H. G. Jones, the original committee consisted of seven men and three women. The committee included Paul Green, Emma Neal Morrison, William S. Powell, David Stick, Dr. Herbert R. Paschal, Dr. Frell M. Owl, Elizabeth Van Moore, and Margot E. Tillitt. From the time of AFHAC's creation, one of Governor Hunt's primary objectives was to obtain a ship similar to those that the colonists would have sailed on during their journey from England to Roanoke Island. Governor Hunt hoped this ship could become one of the cornerstones of the quadricentennial celebration. Hunt created a ship sub-committee and appointed Charles B. Wade, Jr. as it's chairman. Wade, a native of Carteret County, was a graduate of Duke University and vice-president of the R. J. Reynolds Company. According to David Stick's manuscript on AFHAC, the "ship committee was a one-member operation from start to finish," and that Wade "pursued the objective with a determination befitting a long time corporate executive." In February 1979, Wade met with William Avery Baker, a leading architect of period vessels. Avery concluded that there were no prints or plans of any specific vessel used in the Roanoke voyages, so a ship similar in size and representative of one in use at the time would have to be designed and built. Avery recommended three vessels for use as a model, the 140-ton Tiger, the 120-ton Red Lion, and the 50-ton Elizabeth. The Elizabeth, a square rigged, three-masted bark, was chosen as the model. Naval architect Stanley Potter was hired to design the ship and O. Lie-Nielsen of Rockland, Maine was awarded the contract to build the vessel. The ship was named the Elizabeth II and construction began in 1982 on the site of Roanoke Island boat building pioneer George Washington Creef's old boat works, which had been donated to the town of Manteo by Creef's heirs. Measuring 69 feet long, 17 feet wide, and drawing eight feet of water, the Elizabeth II was launched in November 1983, and is now the centerpiece of Roanoke Island Festival Park. [Identification of item], PC.5071, Charles B. Wade, Jr. Papers, Outer Banks History Center, Manteo, N.C., U.S.A. Donated by Charles B. Wade, Jr. in 1994. The Charles B. Wade, Jr. Papers consist primarily of Wade's correspondence, covering virtually every aspect of the Elizabeth II's construction, from the planning stages to the outfitting and vessel launching. The correspondence also discusses channel dredging and licensing issues over the use of the ship's image during the 400th anniversary celebration. Correspondence includes communication, both to and from, William Avery Baker, Stanley Potter, O. Lie-Nielsen, Lindsey Warren, and David Stick.